Well the picture says it all really….the other day was a monumental one for us really our last pig heading towards colder climates..A monumental day because the pig concerned was Rusty…one of our first pigs who with her sister Mere were our breeding sows. Rusty developed arthritis in one of her front legs which if you have ever spent any time with pigs is hard because they’re not the easiest animal to get near and she couldn’t stand for a long time on that leg….the time had come and so the deed was done. As Rusty was getting on a bit (4 years plus) we decided we would make sausages….and so it began. 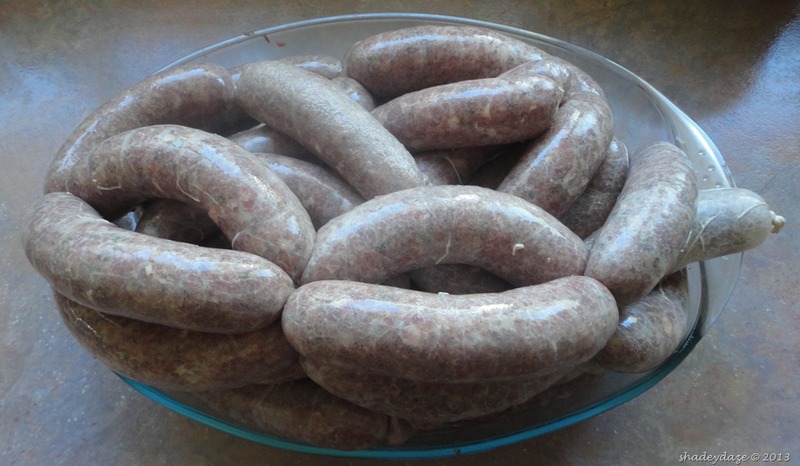 All in all about 25kgs of Sausages – Cumberland Style sausages (didn’t do them in a coil but made them into sausages so they can be done individually if need be) and Worcestershire Sauce and Cracked black pepper….and 5kgs of Salami. On top of that about 10/15kgs of diced pork which will be great for casseroles for the winter, Loins of Pork, Belly – one of which has been turned into bacon and is now sat in the fridge drying out and is going to be cold smoked which is something we haven’t done before. We’ve kept pigs for over 4 years now and it’s a commitment. T has been out everyday feeding – you can’t miss a day and in fact if you’re too late ….well they come looking for you…. and with a snout that can shift up to 2 tonnes that is no problem for them!!! Mmmmm…so you think chooks will ruin your lawn eh? We have always had a strip in front of the flower bed that has been specially created by the chooks …a special place where they scrat about and pull up the lawn! 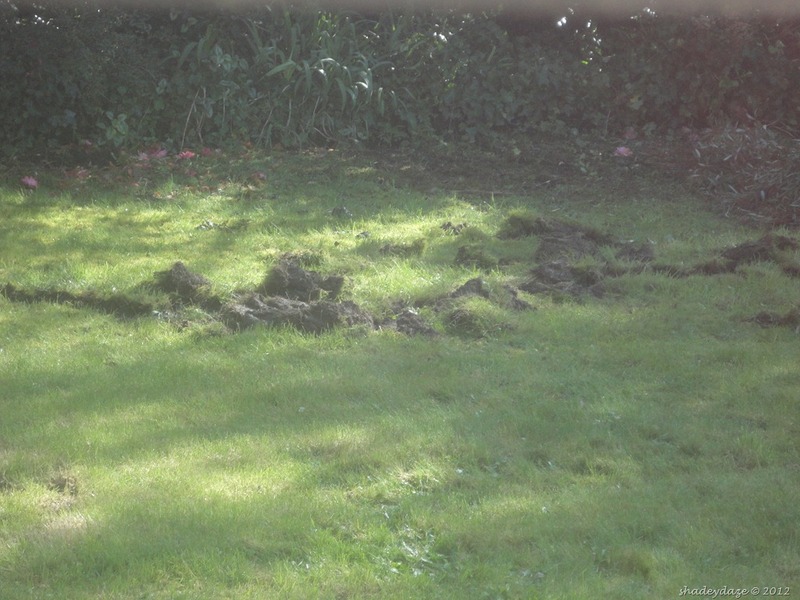 !..Still we’ve always thought well it’s no biggie they’re not doing too much damage and I like seeing them wandering about … well the few that do wander around the garden…I’m not sure I could cope with all of them doing it..we’ve got around 100… we’d have no grass left!! Well we are back to 2 pigs (the lovely Rusty and Minnie) and as a result have started making plans for next year. Keep a boar – we decided not to do this because: we would need to have somewhere separate to keep him when we didn’t want him near the girls. We would be feeding a pig (eventually fully grown) and he would be there only for the purpose of siring new babies. Artificial Insemination – we decided not to do this as there is no guarantee it will work first time. If it does then great you get piglets but that’s it. Raise a boar piglet let him get jiggy and then move him to the cold place in the barn – This is the option we have opted for….we feel this way you get a boar that you are familiar with which means we would feel more comfortable when we’re moving him around or dealing with him. The added bonus is that after we let him get jiggy with the ladies and we have 2 litters of piglets on the way or they are here (whichever comes first!) then we move said boar into that cold place in the barn (aka the freezer). The reason we opted for the last choice was that we get the litters of piglets but in addition we get homegrown pork to boot. This to me seems to be the obvious choice. We have the feed – lots of veg supply for them in addition to meal and we have the space for them. The other advantage of doing things this way is we can change the crossing of breeds to see what kind of meat we get at the end of things …this is the thing we are most interested in. So we know what we get when we cross Large Blacks with Wessex Saddlebacks…I had never eaten pork like it. We chose this cross initially as we wanted to have black-skinned pigs – mainly because we thought it would mean they would be less likely to have sunburn and would have a hardiness for the NZ climate but that it would produce a pig of a larger size than the Wessex Saddleback. This year we decided to try something else….we initially wanted to get a Duroc boar (good bacon pig) but simply there weren’t any around at the moment …so we have got ourselves a Landrace/Large white boar piglet he will hopefully not have too many problems with sunburn and it will be interesting to see what the cross looks like at the end of the day…what colour skin will the babies have?? ?….we’ll find out. So here are Pinky (named by one of my friend’s sons) and Bert (humperdink..if you look at his back he has a bit of a hump going on ..it was either that or Quasi!!). They are a little bit nervous at the moment …hey can’t blame yesterday they were happily ignorant poddling about in the place of their birth..then they were put in a crate and had an hour and a half driving back to our place (yes there was lots of straw to bury themselves in as we didn’t want them freezing to death!). I thought I would get a picture of them inside the hut because it shows just how dinky they really are…they look a bit lost in there at the moment but it won’t take long. Minnie was a bit put out as they have her hut but we won’t put them with the big girls just yet because we want a period of them being on their own to settle and we want the older girls to get used to them being there…and not kill them! So hopefully, as with all the animals we have here, they will have a lovely life whilst they are here with us.